Sen. Elizabeth Warren speaks on Capitol Hill on Feb. 8, 2017. The U.S. Senate floor has been a fierce battleground over the confirmation of President Donald Trump's cabinet picks. Some of the most rancorous debate has been about Jeff Sessions, his pick for attorney-general. Democrats have been strongly opposed to the Alabama Republican over his record on civil rights and immigration, both contentious issues at the centre of the Justice Department's current courtroom fight over Mr. Trump's immigration ban. On Wednesday, a 52-47 vote – split almost precisely along party lines – approved Mr. Sessions's appointment, capping off weeks of divisive argument. But a day earlier, one of the Democrats arguing against Mr. 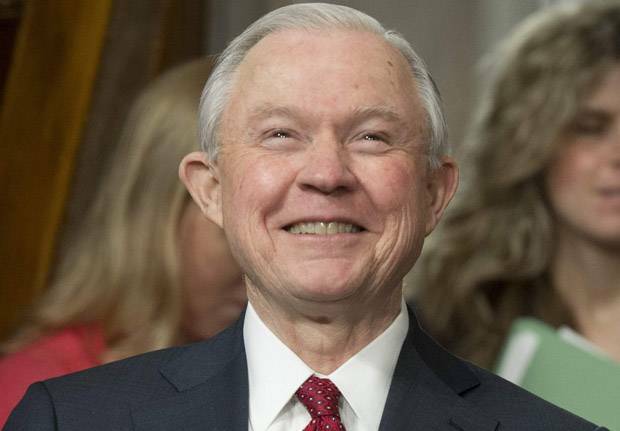 Sessions was ordered to stay silent. Massachussetts Democrat Elizabeth Warren tried to read aloud from a letter from Martin Luther King Jr.'s widow, Coretta Scott King, written in 1986 to oppose Mr. Sessions' appointment to a federal judge's post in Alabama. 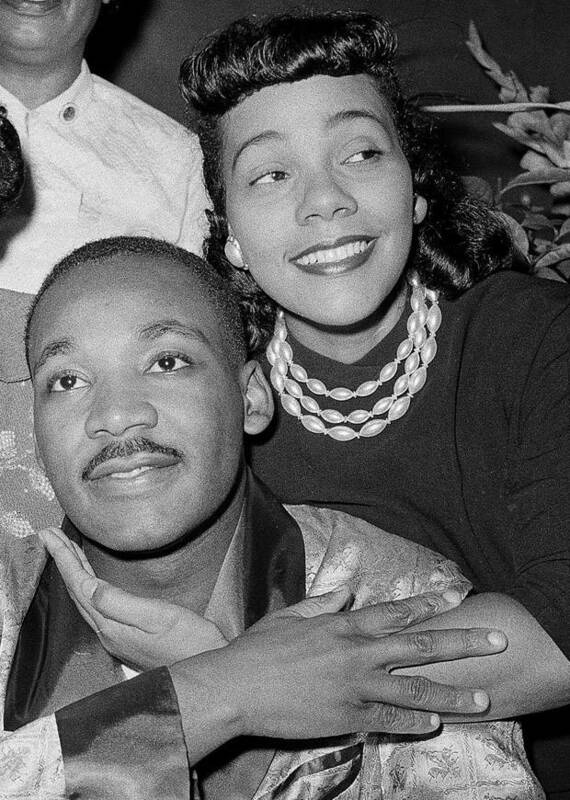 Ms. King, who died in 2006, accused Mr. Sessions of discriminating against black voters in his role as a federal prosecutor. Senate Majority Leader Mitch McConnell, middle, speaks to reporters alongside other Republican senators on Capitol Hill on Feb. 7, 2017. A senator in debate, who, in the opinion of the presiding officer, refers offensively to any state of the union, or who impugns the motives or integrity of any senator, or reflects on other senators, may be called to order under Rule XIX. 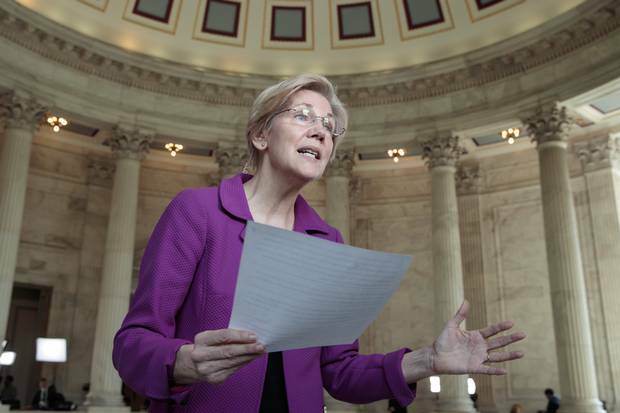 The Senate voted 49-43 along party lines to sustain the decision to rebuke Ms. Warren. 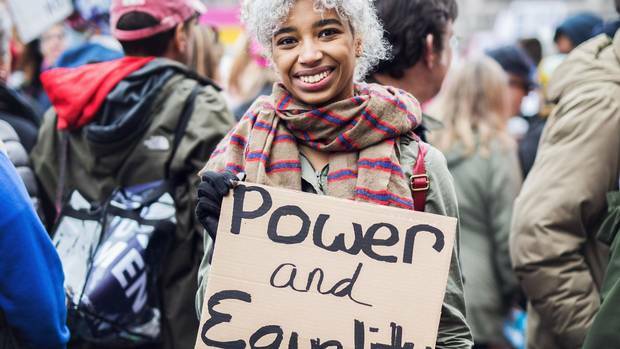 After the vote, other senators, including Bernie Sanders of Vermont and Tom Udall of New Mexico, read Ms. King's letter without facing any objection, prompting some activists to raise charges of sexism. Ms. Warren read the statement from Ms. King in full on Facebook. During the debate on whether to make Jeff Sessions the next Attorney General, I tried to read a letter from Coretta Scott King on the floor of the Senate. The letter, from 30 years ago, urged the Senate to reject the nomination of Jeff Sessions to a federal judgeship. The Republicans took away my right to read this letter on the floor - so I'm right outside, reading it now. The letter Ms. Warren got in trouble for quoting also had a history of being silenced: It wasn't included in the original record for the Alabama senator's hearing in 1986. Staffers from the hearing say a clerical error must have kept it from being included. Anyone who has used the power of his office as United States Attorney to intimidate and chill the free exercise of the ballot by citizens should not be elevated to our courts. Mr. Sessions has used the awesome powers of his office in a shabby attempt to intimidate and frighten elderly black voters. Ms. King wrote that a previous appointment kept her from being in Washington personally to speak against Mr. Sessions. "I request that my statement, as well as this letter be made a part of the hearing record," she asked then Senate judiciary chairman Strom Thurmond, who was an avowed segregationist in his earlier life. She copied in Democrat Joe Biden, who was a U.S. senator from Delaware before becoming vice-president under president Barack Obama. Jim Manley, a Democratic consultant and former top Senate aide, called it "unusual" that the letter would not be included. 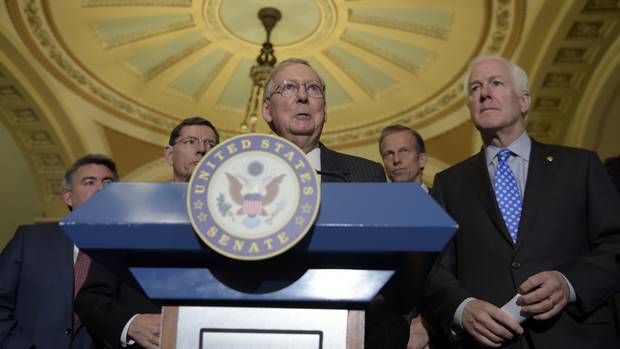 "It think it probably highlights what a flashpoint racial politics played in Sen. Sessions' nomination years ago," Mr. Manley said. Certainly it wasn't by design. It's a perfunctory matter to include letters and statements in support and opposition to nominees and these are often submitted by senators on the committee during the hearing. Counsel for Republicans and Democrats would have reviewed the record before it was final and in this instance it appears the ball was dropped. There was likely nothing nefarious about the letter not being included in the record, added Armstrong Williams, a former Thurmond staffer. There was no hostility between Mr. Thurmond and Ms. King during that period, said Mr. Williams, who has a photo of himself, Ms. King and Mr. Thurmond together. 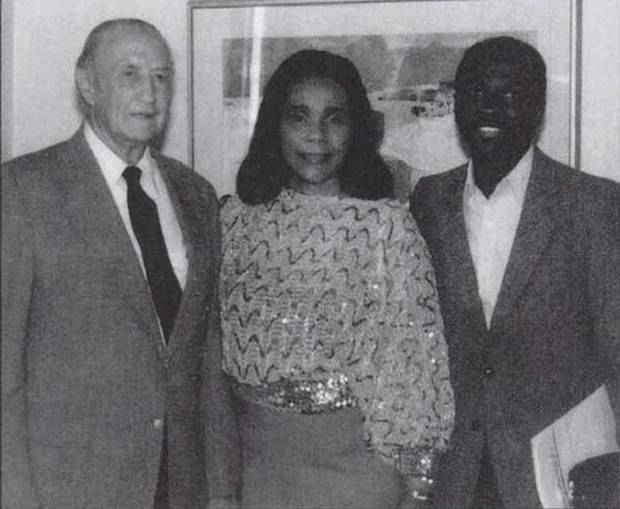 An undated photo provided by Armstrong Williams, shown at right, shows Strom Thurmond with Coretta Scott King. Mr. Sessions sought to punish older black civil rights activists, advisors and colleagues of my husband, who had been key figures in the civil rights movement in the 1960s. Mr. Sessions said he was not a racist, but he said at his hearing in 1986 that groups such as the National Association for the Advancement of Colored People and the American Civil Liberties Union could be considered "un-American." He also acknowledged he had called the Voting Rights Act of 1965 a "piece of intrusive legislation." Mr. Sessions was eventually rejected as a federal judge, but went on to become Alabama's U.S. senator. One of the three activists the King letter mentions, Evelyn Turner, still has not forgiven Mr. Sessions. She said she saw Mr. Sessions in Washington, D.C. last year before his nomination; He attempted to speak to her but did not apologize for his prosecution. "After all these years, my stomach still aches when I think of the pain he caused so many people," she said in a January letter to the Senate Judiciary Committee. 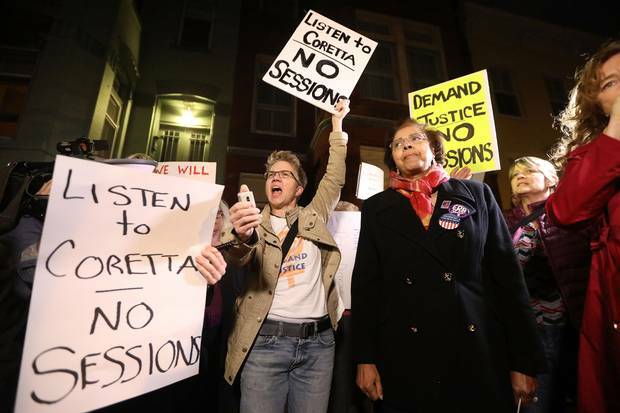 Protesters demonstrate outside the house of Senate Majority Leader Mitch McConnell in Washington ahead of the Senate vote to confirm Jeff Sessions as attorney-general on Feb. 8, 2017. You don't insult – whether it be from a letter, or from a message from God, or on golden tablets. That's the rules of the Senate. They want to complain about it, complain about it. Denigrating people who disagree with us, I think, is not a healthy trend for our body. Nasty women are tough. Nasty women are smart. And nasty women vote. ... We nasty women are going to march our nasty feet to cast our nasty votes to get you out of our lives forever. For Ms. Warren's supporters, the controversy over the King letter was the latest and most visceral example of a woman muzzled by men who seemed unwilling to listen. Critics saw something else: a senator who has rankled members of both parties with her nose for the spotlight lobbing a far-too-early salvo in the next presidential race. "A lot of that's about 2020 politics," Republican Senator John Thune said on MSNBC. 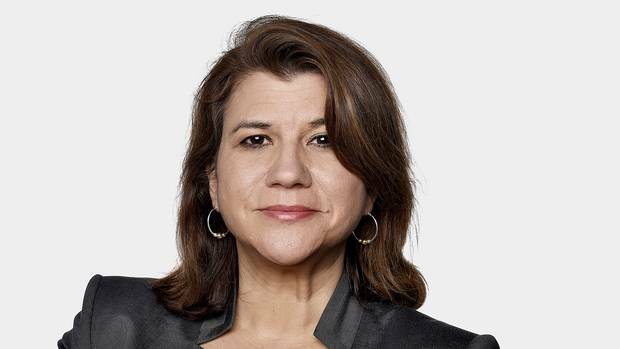 Elizabeth Renzetti: Warren, persistance, resistance and the mouthy sisterhood What really gets under the skin of this testosterone-poisoned administration is women speaking up. That, no matter the silencing efforts, they persist. 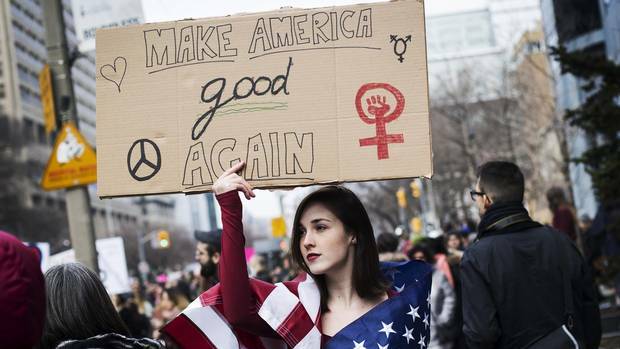 Canadian Women's March protesters plan long-term activism They’re not ready to put away their protest signs and pink knitted hats just yet, Ingrid Peritz explains.